Prenuptial agreements have become part of the landscape in modern marriage. While such agreements may sound impersonal and may seem to envision problems before they arise, in reality this is not the case. Mediated prenuptial agreements present neutral ground for couples to have meaningful discussions about practical and financial matters that are sometimes hard to conduct in the midst of a courtship. Many couples who have participated in a mediated prenup say that they found their whole relationship benefited from the process, that they were able to discusses difficult and disputed areas in a calm and reasonable fashion. Far from encouraging divorce, a well considered prenuptial agreement encourages a lasting relationship. Legalization of gay marriages in NY State has brought about a flood of marriages, many of long established LGBT couples. In these instances, there are often complex property and other issues that may be difficult to address. A mediated prenuptial agreement will settle issues equitably and satisfactorily for both parties and represent an increasingly common use of the mediation process. 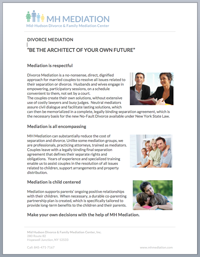 Our mediators are comfortable in dealing with all types of prenups and find it to be a growing part of our practice.